The National Award winner actor Dhanush, who recently won the National award for one of his production ventures 'Kaakka Muttai' will soon act in its filmmaker Vetrimaaran direction. Though KollyInsider has earlier reported viewers about Dhanush-Vetrimaaran fourth time collaboration, the filmmaker has now officially announced the project in Kaakka Muttai Press meet. The film has been tentatively named 'Soodhadi' and as the title suggests this film will be intensely focused on gamblers and their lives. 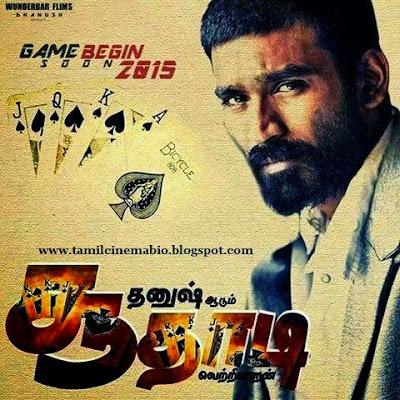 Parthepan plays an important role in this movie, as a big shot gambler and Dhanush might be a gambler in the film too. The shoot for this film will start by the end of next month and the details about the rest of the cast and crew will be followed shortly!. Some sources revealed that Lakshmi Menon pairs with Dhanush and Meenakshi will be pairing Parthepan. We all know that this Vetrimaaran-Dhanush combo means success, just like 'Polladavan' and 'Aadukalam'. Shooting starts from September. It was known that Dhanush and GV Prakash were good friends and they worked together in may projects together and gave super hits. They both and some of his friends even had a trip to Monaco for vacation. But there were rumour that has gained speculation in Kollywood when announced that the ace composer G V Prakash Kumar will not compose music for Dhanush's next movie Soodhadi and director Vetrimaaran, a close friend of the actor, is now forced to find a replacement in upcoming composer Santosh Narayanan. GV Prakash who is very close to Vetrimaran, and has scored music for all the five films directed and produced by him has quietly moved out of Soodhadi. The reason is that GV didn't want to work for Dhanush and his Wunderbar films who are producing Soodhadi. Nobody is aware of the exact reason for the reported fallout between one-time best pals, Dhanush and Prakash, but it has been Kollywood's best-kept secret. There are two versions to GV Prakash's exit from Soodhadi and rift with Dhanush. GV Prakash and Dhanush had been thick friends and have worked together in Aadukalam (that won Dhanush his National Award) and Mayakkam Enna. Post that however, their relationship turned sour due to a misunderstanding. In fact, Anirudh – who’s related to Dhanush and is very close to him – was also part of this clique. When director Selvaraghavan was to sign on GV Prakash for Irandaam Ulagam, it’s rumoured that Dhanush stepped in and asked his brother to sign on someone else. Thus, Harris Jayaraj was roped in. And it seems to be the same case now with the Vetrimaaran film says a source. The hit team from Aadukalam was supposed to work together once again but Dhanush allegedly told director Vetrimaaran that he wasn’t comfortable working with GV Prakash. So music director Santhosh Nayarayan was brought in. There are rumours that Anirudh also doesn’t get along with GV and they are seen as competitors. However, it looks like Anirudh doesn’t have issues with him as he called up GV after the release of Darling to congratulate him on its success.